A new version 0.8.2.1 with many awesome features is released! Now, not only can you enjoy new and updated awesome weapons, but most interestingly, you also can invite your friends into the game and play it together. 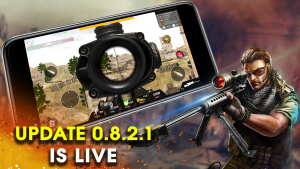 Morever, you can also chat directly in a battle with other real snipers all over the world. Are you ready? Join the game to enjoy all these features and feel free to share with us your feedback. Morever, after this update 0.8.2.1, something special about the next big version is revealed: SOLO MODE 1vs1, DUO MODE and NEW MAP. It will be launched as soon as possible. Hope you will have more fun with Bullet Strike! Hi, update into version 0.9.1.1 of the game. Now you can enjoy the new map and play with your friend!